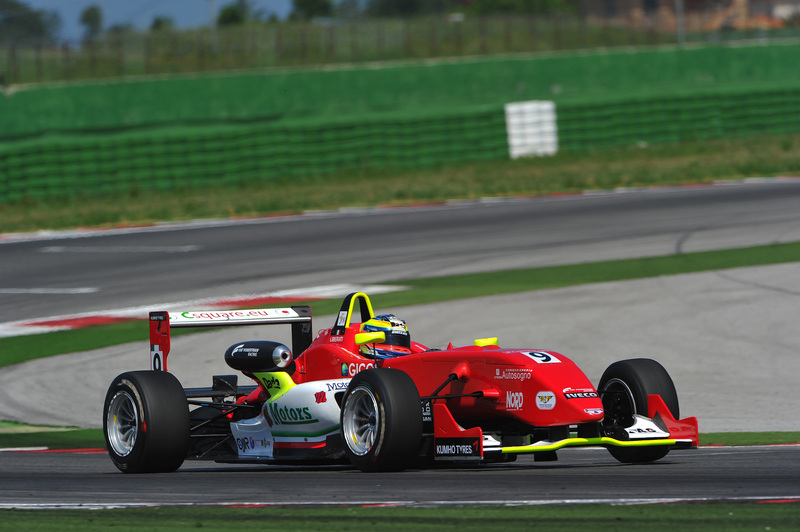 04/06/2011 - Edoardo Liberati set once again the pace in the Italian Formula 3 Championship. The qualifying session valid for the second round of the season of the prestigious tricolored series powered by Fiat Powertrain Racing ended with the driver for Team Ghinzani leading the charts with a laptime of 1´30.998, at an average speed of 167,166 km/h. The pole position was decided at the end of a duel on the edge of hundreds of seconds between Liberati and Sergio Campana. The BVM-Target driver was fastest with the first set of tyres but had to give up in the final of the session for just 14 thousands of a second. The first row of race one will be the same of the first round of the season but the third place was this time secured by the ever more convincing Michael Lewis, first of the rookies and just a tenth shy Liberati's time. On the side of the Prema Powerteam's Californian, Kevin Giovesi (Lucidi Motors) will start from the fourth position of the grid; the third row will be occupied by the French Maxime Jousse (BVM-Target) and the Argentine Facu Regalia (Team Ghinzani), slightly delayed in the timesheet with a gap of 453 thousands from the pole position. Just 3 thousands shy the South American, Lello Marciello (Prema Powerteam) gained the seventh place right ahead of three rookies bloomed from Formula AciCsai Abarth ground: Eddie Cheever (Lucidi Motors), 7 thousands shy, Brandon Maisano (BVM-Target) at a bit more than a tenth; the Brazilian Victor Guerin (Lucidi Motors) completed the top ten. As always, gaps are very small and the top ten drivers are all within a 7 tenths interval, while the top eight drivers are in just half a second. The appointment is now for this afternoon's race one at 16.15 (local time, GMT+2). Race two will start tomorrow at 10.10 instead.